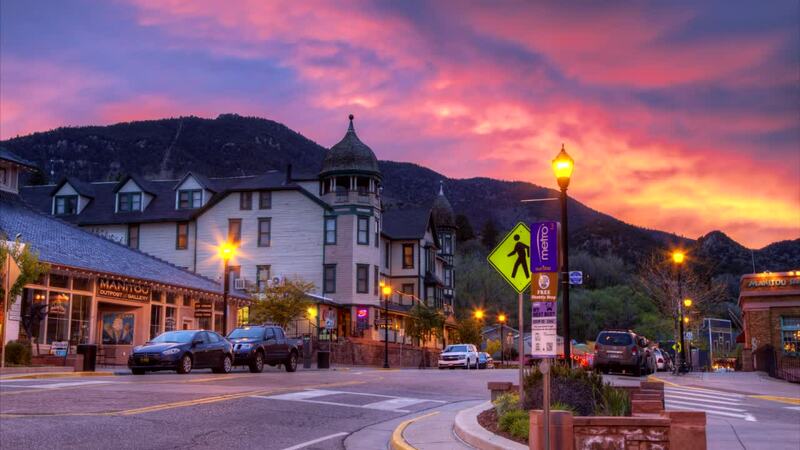 Discover the historic charm of Manitou Springs. Nestled between Pikes Peak and the Garden of the Gods, Manitou Springs is centrally located & close to all major attractions in the Pikes Peak Region. We offer a variety of lodging - including cabins, bed & breakfasts, hotels/motels, & RV Parks/campgrounds. Let us be your "Base Camp" as you enjoy all of the attractions & activities the area has to offer. Taste the naturally carbonated mineral water that made Manitou famous as you stroll our historic downtown district. Meet the artists as you discover our many art galleries. We are proudly a Colorado Creative District. Find the perfect gift or souvenir in the boutique shops throughout town. Rest & rejuvenate as you relax and dine in one of the many delicious cafes & restaurants. We have hiking trails for families that meander along Fountain Creek as well as the extreme verticle challenge of Barr Trail reaching the 14,115 foot summit of Pikes Peak. Come and enjoy the many Special, sometimes zany, Events held throughout the year. "Escape and Enjoy" Manitou Springs!